On Wednesday April 9th, S&C Electric Company invites Microgrid 2018 attendees to their global headquarters in Chicago to visit the Smart Grid Solutions Demonstration Center. The demonstration center will allow you to see, in real time, how smart grid technologies respond to grid issues and optimize power delivery systems. The tour includes interactive exhibits that display S&C’s solutions such as microgrids, self-healing technology, energy storage integration solutions and communications systems. 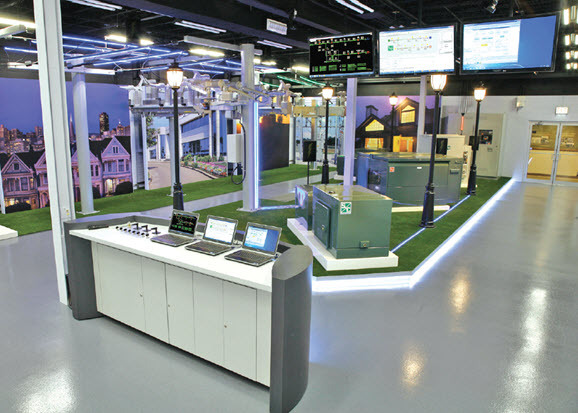 The interactive exhibits showcase the benefits of these technologies and demonstrate how S&C’s solutions can improve the efficiency and operating performance of the electrical grid. The Smart Grid Solutions Center showcases S&C’s solutions for the self-healing grid. It features a range of underground and overhead distribution products in their true application settings. Visitors can see demonstrations of fault isolation and service restoration, pulseclosing, energy storage, and fast peer-to-peer communication networking. IntelliLab allows a user to witness factory acceptance testing of their custom-engineered S&C IntelliTeam® SG Automatic Restoration System, to confirm that this software-based solution performs as intended under realistic scenarios simulated for the user’s specific distribution system. The Advanced Technology Center features a world-class high-power testing laboratory which enables S&C to accelerate development and delivery of the highly-sophisticated automatic service restoration, energy storage, and power quality equipment needed for the Smart Grid.